Reading the paper while I drink my coffee in the morning is one of my favorite ways to start the day. Yes, I still get the news through print medium instead of just through the internet like many in my age group and those who are younger. Since we get the paper delivered daily, you can imagine how quickly it accumulates around our home. The good news is that I’m always either recycling or re-using the paper in some form. 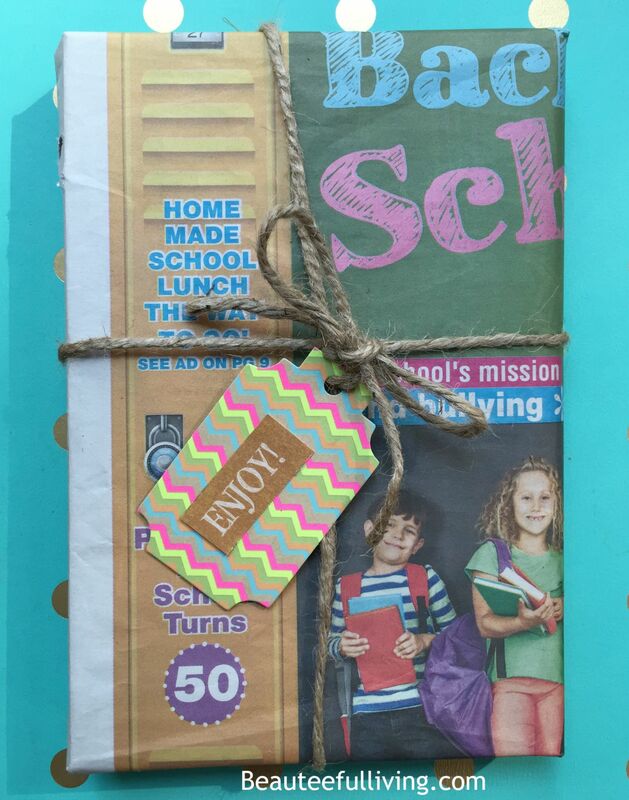 In the photo below, I wrapped a book I gave to Ellie as a little “Back to School” gift. 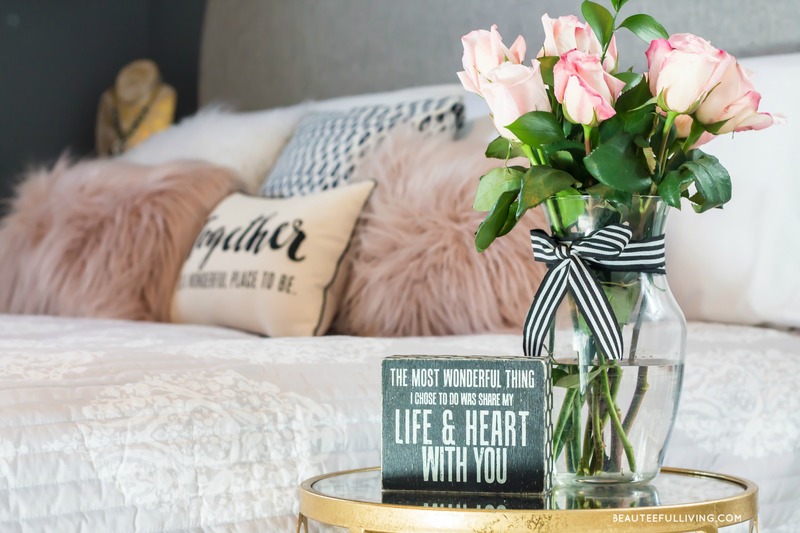 If you want to make newspaper wrap look extra beauteeful, simply add ribbon (or twine) and a cute tag to complete the look. By lining your vegetable drawer, you will be able to keep your drawer odor free as well as absorb any mess from rotten produce. Replacing the newspaper once a week is about as frequent as you will need. Just doing this simple trick can prolong the life of your produce by 3 – 5 days. Not only are you saving money from not having to use paper towels, the newspaper provides excellent streak-free and lint-free cleaning! 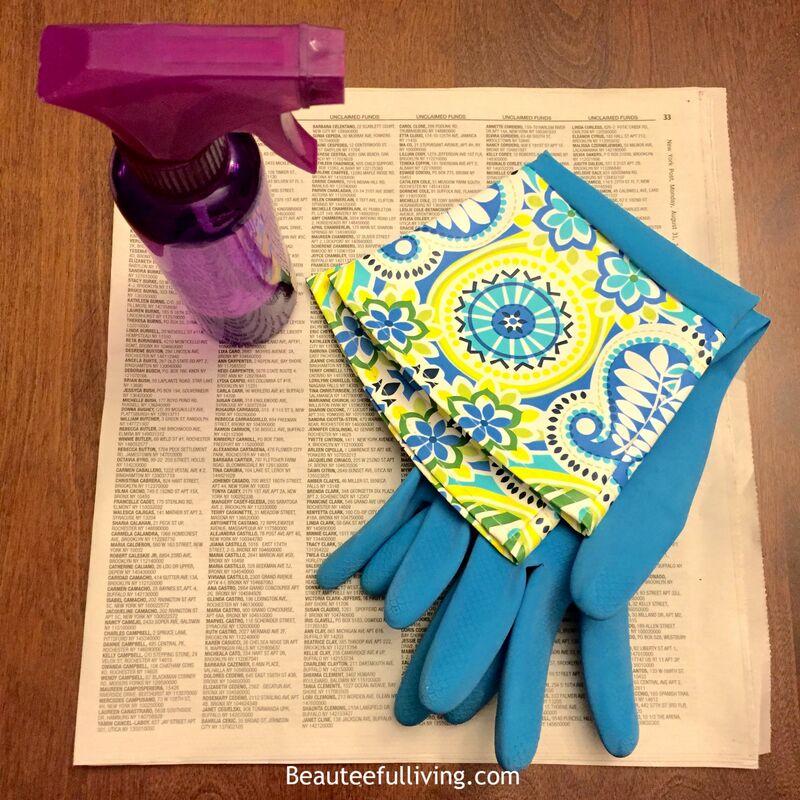 Just ball the newspaper up and clean your glass doors and windows as you normally would with paper towels. P.S. You can create an effective and chemical-free cleaning solution by combining 50% distilled white vinegar and 50% tap water. Add a few squeezes of lemon if you want to diffuse some of the vinegar scent. 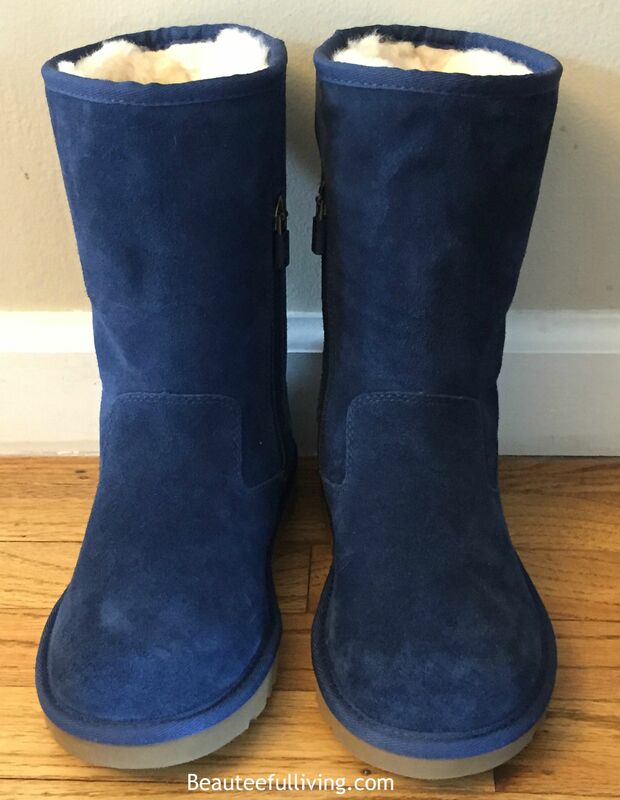 To prevent boots from slouching or losing their original shape, stuffing them with newspaper after use is a great alternative to using boot shapers. Tip: For easy access, leave a bag of balled up newspaper near your shoe storage area. Those “wee wee” pads can get pricey quick. Newspapers work just as well. Just be sure to include enough layers! Why use brown paper bags to ripen avocados or tomatoes when you can simply use a sheet of newspaper to do the same job? Just be sure to leave opening on top to allow ripening process as well as avoid mold from forming (this pertains to tomatoes especially). I love this trick of soaking newspaper in water and laying the sheets over a warm barbecue grill. 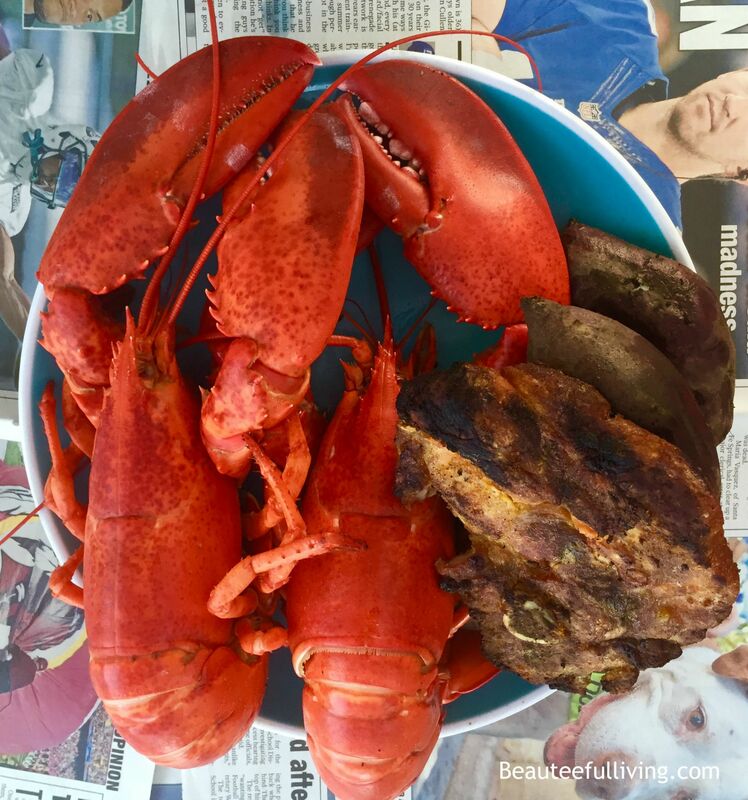 All you have to do is close the BBQ lid and leave the newspaper for approximately an hour. After that, simply remove the newspaper and wipe the grill until clean. Make your own Swiffer duster by simply rolling newspaper, wrapping the middle with a rubberband, cutting strips on one end and then using it to remove cobwebs inside or outside your home. You can combat odor in footwear by stuffing your shoes/sneakers/boots with balls of newspaper. Simply leave the newspaper balls overnight and the odors will disappear by the next day. I hope you found these 10 tips helpful. You can bookmark this page or Pin It for future reference! Don’t forget to share with others who may benefit from these thrifty and useful ideas. You’re the best! Did you have a favorite from these 10 tips featured today? Do you have a favorite way of reusing newspaper? Xo, Tee. I have been told that the ink in newspaper contains jewelry polish especially good for cleaning mirrors and windows and they shine and stay cleaner longer! I use them all the time. No wonder newspaper works so well for cleaning mirrors & windows! Thanks for commenting & sharing that tidbit with me! This is great. I get the Sunday paper for coupons and never know what to do with it after. Some great ideas! 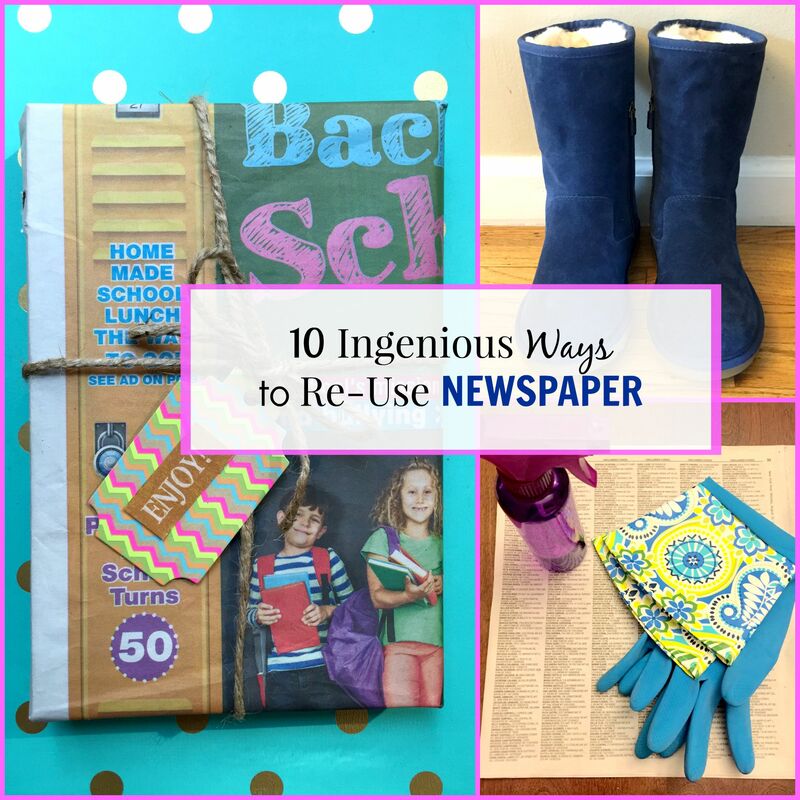 Love your ideas for reusing newspaper. I remember when my Dad and I had a compost pile – we used to tear it up and add it to the heap. Helped make the richest soil I’ve ever seen. I like the idea of keeping the boot shape with them, and lining the veggie drawers is so smart too. I used to use it for crafts and messy work around the table, but I don’t take the newspaper anymore so I miss having it around. These are great uses. I always use newspapers to line vegetables drawers and to clean windows. These tips are very useful. Not to mention also, helpful for our environment. I have heard newspaper is amazing for cleaning windows. I’m going to give it a try. Congrats on your upcoming appearance! I pretty much just recycle mine so thanks for some new ideas! What a a fun adventure! I’ve always wanted to be invited to NYC on someone else’s request. Loving the veggie drawer liner idea. 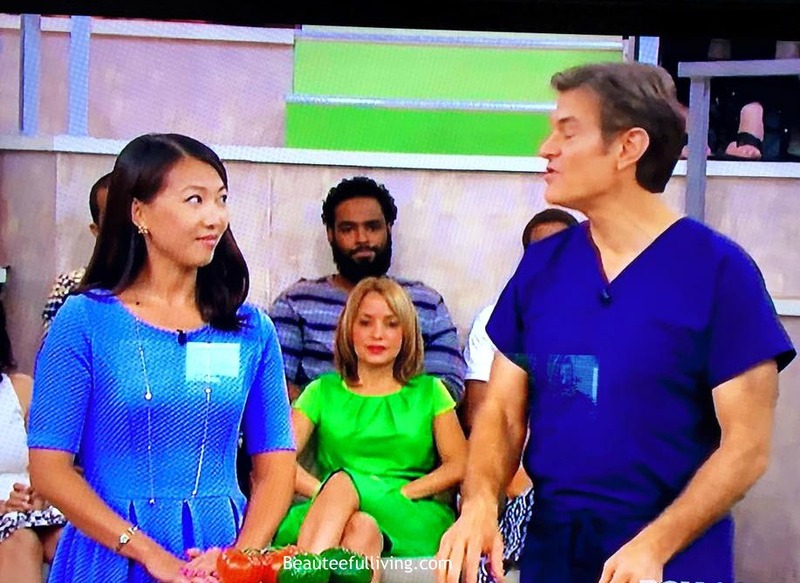 Congrats on being on TV. So excited for you. I use newspaper to package my lotions and bottles when I’m shipping to customers. I also like your idea of using it as wrapping paper. I love these ideas! I never thought about lining the vegetable bin with them! Totally going to start doing that! Newspaper is also the best for cleaning window’s! I’ve been wrapping gifts in reused newspaper and brown paper bags for years. My Mom did it with the Comics section of the newspaper when my siblings and I were growing up. 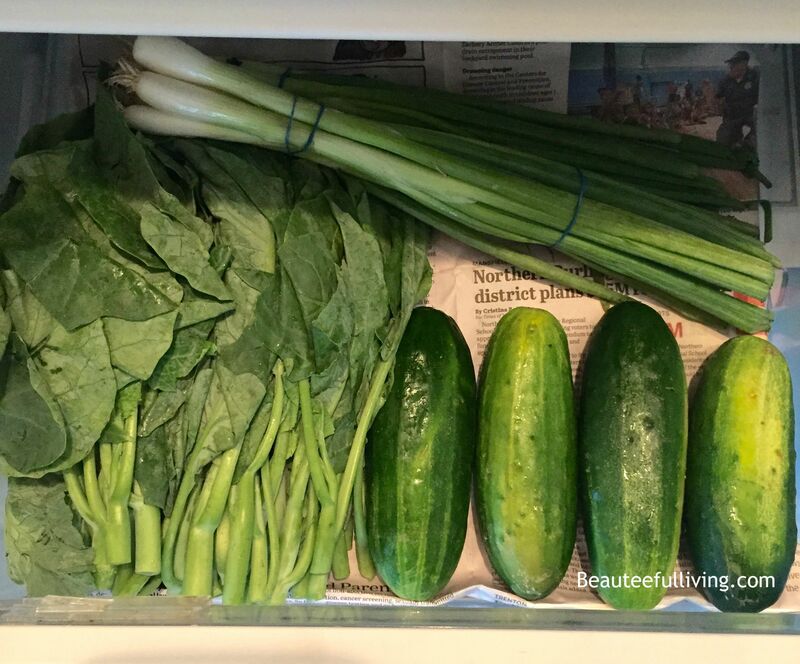 🙂 Love the veggie crisper drawer idea too! Newspaper and brown papers definitely make great wrapping paper. Thanks for stopping by, Jennifer. Great ideas!! It’s always nice to see how things that usually get thrown away, can be reused for something else!! Love it! Yes, we still love our newspaper :). I love these ideas! I am so excited to catch your TV debut on Thursday! I would have been a nervous wreck, go you! Thanks, Emily! I’m sure you would be cool as a cucumber come show time on TV :).